This article provides advanced configuration information for the SiK Telemetry Radio. It is intended for “power users”, and those who wish to gain a better understanding of how the radios operate. Most users will only need the basic guide and feature overview provided in SiK Radio v2. You can use the MAVLink support in the SiK Radios to monitor the link quality while flying, if your ground station supports it. The two key message parameters are RADIO.rssi and RADIO.remrssi. The first is the RSSI (signal strength) level that the local radio is receiving at. The remrssi parameter is the RSSI that the remote radio is receiving at. Here is a typical graph of the RSSI levels for a flight at my local flying field. The reason the RSSI varies so much during this flight is that the signal is attenuated when the plane is rolled over in a turn as I was using a simple wire antenna in the plane. The RSSI values for this flight were plenty high enough for the link quality to be excellent throughout the flight using the default radio parameters. If you get less range than you would expect from the above information then what you need to do is graph the noise and signal levels from a flight to work out what the problem is. The most common source of range problems is noise. Noise is unwanted radio emissions in the same frequency range that your radio is using that interferes with the operation of your radio. The radios have telemetry logging built in to help you diagnose the source of the noise. For the best possible range you want the two noise lines to be low, and the two signal lines to be high. In the above graph (taken from my SkyFun with a pair of 3DR 433 radios) you can see that the noise levels in the plane are higher than the noise levels on the ground. Also note that at the start of the flight (before I started the motor) the noise levels on the plane were lower, then they went up after I started the motor. That shows I’m getting some noise from my motor. If I wanted more range I would need to move the radio further from the motor and ESC. Perhaps the most common source of noise with the 3DR-433 is noise from the USB bus on your ground station. That shows up as high values for the RADIO.noise value. If you get this, then you could try using a different USB cable, or a different laptop. You can also try using a USB hub between your laptop and your radio. If the ‘rssi’ and ‘noise’ levels meet on the graph then you will lose the link. To determine what your range would be, a rough rule of thumb is to subtract the ‘rssi’ and ‘noise’ numbers, then divide by 2. That tells you your “fade margin” in decibels. For each 6dB of fade margin your range doubles. So if you have 18dB of fade margin, then you will be able to do roughly 8x whatever range you were at when you measured the margin. Another key source of range problems is the antenna placement. Your ground station antenna should be well clear of obstructions and a couple of meters off the ground. You may need to build a stand to hold it to get the best range. The SERIAL_SPEED and AIR_SPEED parameters are in the same form that APM uses for the SERIAL3_SPEED EEPROM parameter. It is the rate in kbps, truncated to an integer. So ‘9’ means 9600 baud, ‘38’ means 38400, ‘115’ means 115200 etc. The key parameter that controls the range of your radios is the AIR_SPEED. The default is 64 (which is 64kbps) will give you a range of over a kilometre with small omni antennas. The lower you set the AIR_SPEED the longer your range, although lowering the AIR_SPEED also lowers how much data you can send over the link. The radio firmware can only support 13 possible air date rates, which are 2, 4, 8, 16, 19, 24, 32, 48, 64, 96, 128, 192 and 250. If your application needs a different air rate for some reason then we can potentially add it to the register tables. If you choose an unsupported air rate then the next highest rate from the supported list will be chosen. For most telemetry applications you will primarily be sending data mostly in one direction, from the aircraft to the ground station. For most people, the amount of data sent from the ground station to the aircraft is small, just an occasional control packet plus heartbeat packets. If you are using a joystick to control your aircraft then you will be sending a lot more data from the ground station to the aircraft, and in that case you may find a higher AIR_SPEED is needed, although your range will be reduced. The ECC parameter makes a big difference to the data rate you can support at a given AIR_SPEED. If you have ECC set to zero, then no error correcting information is sent, and the radio uses a simple 16 bit CRC to detect transmission errors. In that case your radio will be able to support data transfers in one direction of around 90% of the AIR_SPEED. If you enable ECC (which is highly recommended), then the data rate you can support is halved. The ECC system doubles the size of the data sent by the radios. It is worth it however, as the bit error rate will drop dramatically, and you are likely to get a much more reliable link at longer ranges. If you have the latest APM firmware (Plane 2.33 or later, or Copter 2.54 or later) then the APM will automatically adapt its telemetry rates to what the radio can handle, by using MAVLink RADIO packets injected into the MAVLink streams by the radios firmware. That allows you to ‘oversubscribe’ your link, by setting up a SERIAL_SPEED larger than what the radios can actually handle. The other factor in choosing the air data rate is the TDM ‘sync time’. The two radios need to work out each others frequency hopping pattern. They do this by slowly changing the receive channel while rapidly changing the transmit channel. This process of getting in sync with the other radio takes just a few seconds at high air data rates, but gets slower for low air data rates. For most amateur UAV applications the default AIR_SPEED of 64 with ECC enabled will be good. As mentioned above, the radios support a 12/24 Golay error correcting code if you set the ECC parameter to 1. This means that for every 12 bits of data the radio will send 24 bits, calculating the bits using Golay code lookup tables. The process is reversed on the receiving end, and allows the radio to correct bit errors of up to 3 bits in every 12 bits send (i.e. 25% bit error rate). The downside of the ECC option is that it halves your available data bandwidth, but in most cases this is worth it, as you are able to sustain a reliable link over longer ranges. You will also get a lot less ‘noise’ in the serial stream. If you set the MAVLINK option to 1 or 2 then the radio will do ‘MAVLink framing’. The MAVLink protocol is used by APM for transmitting telemetry date to a ground station. 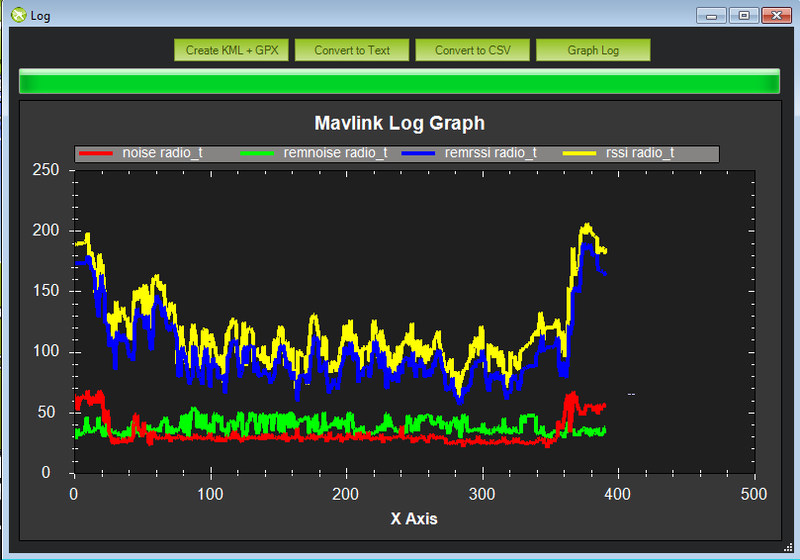 When MAVLink framing is used, the radio will try to align radio packets with MAVLink packet boundaries. This means that if a packet is lost you don’t end up with half a MAVLink packet being seen by the receiver. That partial packet would appear as line noise on your ground stations console. If you set MAVLINK to 2, then in addition to doing MAVLink framing the radio will look for RC_OVERRIDE packets (used for joysticks) and ensure that those packets get sent as quickly as possible. This option is useful if you are using a tablet based joystick for control. The radio firmware will try to fit multiple MAVLink packets into one radio packet where possible for maximum efficiency. The highest radio packet size is 252 bytes. The radio firmware supports both the MAVLink 0.9 and the MAVLink 1.0 transmission formats. If you have MAVLINK set to 1, then the radio firmware will also look for MAVLink HEARTBEAT messages coming from the serial connection. If it sees a HEARTBEAT message then it knows that the MAVLink protocol is in use, and it will start injecting MAVLink ‘RADIO’ status packets into the the serial stream. 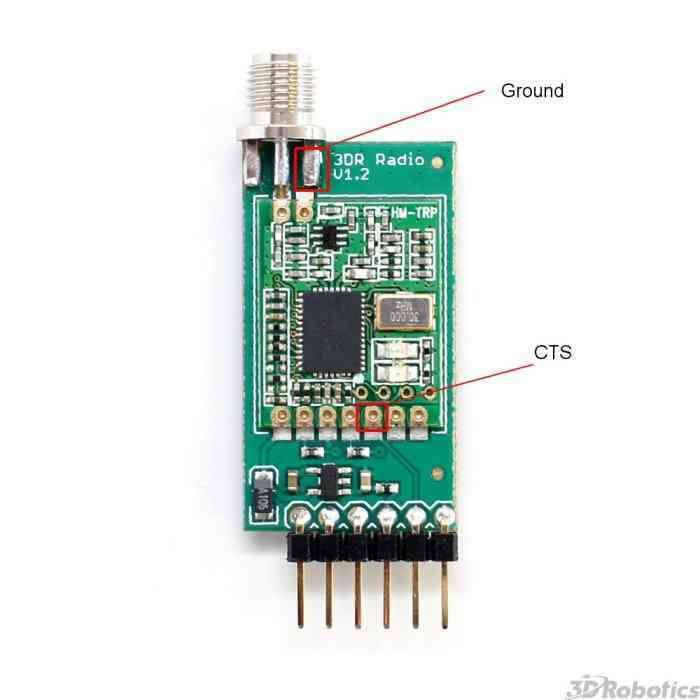 The RADIO packets contain information about the RSSI (Received Signal Strength Indicator) level at both ends of the link, allowing the ground station or aircraft to take action in case the link quality falls too low. The RADIO packets also contain information about error rates, and how full the serial transmit buffer is (as a percentage). The latest APM firmware can use this information to automatically adapt the telemetry stream rates to the data rate that the radios can sustain. You need to be very careful to configure your radios to stay within the legal power limits of the country you are operating in. The default power level of 20dBm is fine for the US and Australia, as up to 30dBm is allowed by the LIPD class licenses there in the 915-928MHz frequency band for a frequency hopping radio. So as long as your antennas have a gain of less than 10dBi you should be within the ISM rules. If you choose an unsupported power level the radio will choose the next highest power level from the above table. Please carefully check the EIRP (Equivalent isotropically radiated power) power limits for your country, making sure you take into account the antenna gain. The radio is a ‘DIY’ radio part and it is entirely your responsibility to ensure any use of it is compliant with local rules. For example, if your local rules allow for a maximum of 30dBm (1W) EIRP, then if you use a amplifier with a 12dB transmit gain, and an antenna with 3dBi gain, then you will need to set TXPOWER to at most 14. If you don’t know how to calculate it, we’ve made a tutorial for you here: Understanding dB, Watts and dBm. The radios support a variant of the Hayes ‘AT’ modem command set for configuration. If you connect with a serial console to a radio at the current serial baud rate, you can tell the radio to enter AT command mode by entering the sequence ‘+++’. To prevent data being seen as the command sequence there is a guard time required, so make sure you type nothing on the serial link for 1 second before and after you enter the sequence. When you enter AT command mode you will receive a ‘OK’ prompt from the radio and it will stop displaying data sent from the other radio. Once in AT command mode, you can give the radio either ‘AT’ commands to control the local radio, or (if successfully connected) you can use ‘RT’ commands to control the remote radio. all of these commands, except for ATO, may be used on a connected remote radio by replacing ‘AT’ with ‘RT’. The first column is the S register to set if you want to change that parameter. So for example, to set the transmit power to 10dBm, use ‘ATS4=10’. Most parameters only take effect on the next reboot. So the usual pattern is to set the parameters you want, then use ‘AT&W’ to write the parameters to EEPROM, then reboot using ‘ATZ’. The exception is the transmit power, which changes immediately (although it will revert to the old setting on reboot unless you use AT&W). the other settings may be different at either end of the link, although you will usually set them up the same at both ends. Most users will want to set the DUTY_CYCLE to 100. The DUTY_CYCLE is the maximum percentage of time that the radio will transmit packets. The reason the duty cycle is included is that some regions of the world allow for higher transmit power or more frequencies if you have a duty cycle below a given threshold. So for example in Europe you can transmit on a wider range of frequencies in the 433 band if your duty cycle is below 10%. When you set a duty cycle below 100% then your available bandwidth will be reduced, so you will find it will only work well for telemetry at higher baud rates. It is still quite practical to get good telemetry from an APM with a 10% duty cycle, as telemetry traffic is quite ‘bursty’, so the average transmit time is not generally high anyway. For example, you can easily receive all telemetry streams at 2Hz with AIR_SPEED set to 128, ECC enabled and a DUTY_CYCLE set to 10. You can also set a radio to receive only by setting the DUTY_CYCLE to 0. That will work best if you set NUM_CHANNELS to a low number, as otherwise the clock synchronisation will be poor. Set MAVLINK to 2. This turns on special checking for the RC_OVERRIDE packets used in joystick control, to allow those packets to always be sent first. If you are using mavlink (you probably are) there are no downsides for choosing this setting. Change MAX_WINDOW from the default of 131 to 33. This will ensure that the GCS can send a packet to the vehicle at least once every 33 msecs. It is worth noting that this will lower the available bandwidth, so if you need absolute maximum bandwidth you are best off with the default of 131. Both radios on a channel must have the same value for this parameter, or they will not be able to talk to each other. The radio can implement ‘listen before talk’ (LBT) functionality to allow it to comply with a wider range of regional regulatory requirements. LBT is a system where the radio is required to listen for a period of time and see no signal from other radios before it is allowed to transmit. By using a non-zero LBT_RSSI value your radio will become more ‘polite’, by waiting until everyone else has stopped transmitting before starting to transmit itself. To enable LBT in your radio you need to set the LBT_RSSI threshold. This is the signal strength that the radio considers to be an indication that the channel is busy. If you set LBT_RSSI to zero then LBT is disabled. The minimum non-zero setting is 25 which is a few dB above the receive sensitivity of the radio (-121 dBm). To setup LBT_RSSI you need to know what signal level your local radio regulations require for LBT functionality. Each increment in LBT_RSSI above 25 is roughly equal to 0.5dB above the radios receive sensitivity. So if you set LBT_RSSI to 40 then the radio will consider the channel to be free if the signal strength is less than 7.5dB above the receiver sensitivity. This formula is approximate, but quite close. See the Si1000 data sheet for a more precise graph. You will need to lookup your local regulatory requirements to see what LBT_RSSI setting you should use. The LBT implementation in the radio uses a minimum listen time of 5ms, plus randomised listen time as per the European 9.2.2.2 rules. Note that in many regions you need to implement LBT in conjunction with AFA (Adaptive Frequency Agility). The radio implements AFA as long as you have NUM_CHANNELS set to more than 1. The firmware for the radios is open source, and new features are regularly added. You should check for new releases regularly to get the most from your radios. 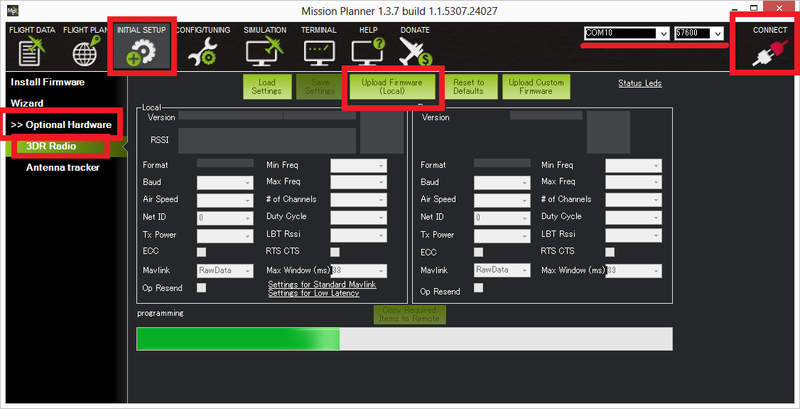 Open the Mission Planner and go to the Initial Setup | Optional Hardware | SiK Radio page. Select the correct COM port and set the baud rate to 57600. Ensure the “Connect” button is in a disconnected state as shown in the image below..
Press the Upload Firmware (Local) button and after a short delay, the “programming” message should appear and the green bar should slowly increase from the left to right. The above process should be performed for both radios. Occasionally a new firmware update will modify some settings so it might be a good idea to compare the settings before and after and look for changes. The recommended approach for configuring 3D Radios is to use Mission Planner, as discussed here. You’ll know the FTDI cable is correctly oriented on the air radio when a green LED blinks. In MP, press Configure | SiK Radio and enter exact same settings including advanced > click Save Settings. Click on Update Firmware while connected to each radio in turn. Then repeat the above. This section of the wiki was contributed by the Documentation User Group (DUG). If you somehow manage to get your radio in a state where you can’t upload a new firmware via the Mission Planner then you may need to force the radio into bootloader mode. The way firmware upload normally works is the planner connects to the radio and sends a AT&UPDATE command to put the radio into bootloader mode ready to receive a new firmware. That only works if the planner can send AT commands to the radio. If you can’t send AT commands, then you can force bootloader mode by shorting the CTS and GROUND pins on the radio while powering on. The red LED will light up when in bootloader mode. After you have the radio in bootloader mode you should be able to upload a firmware. When evaluating if this radio meets your local regulations it may be helpful to know what technology it uses. The firmware implements frequency hopping spread spectrum (FHSS) with synchronous adaptive time division multiplexing (TDM). Additionally, the radio skews the base frequency by up to one channel using a random seed based on NETID. This means that two radios using different NETID numbers use slightly different frequencies. The radios use GFSK (Gaussian Frequency Shift Keying) for transmission on a particular frequency. the EEPROM parameters determine a set of TDM parameters, particularly the transmit window and silence period, both are in 16 microsecond units. You can view the results using ATI6. The two radios synchronise their clocks automatically by adding 13 bits of timestamp information to all packets. The timestamp is in 16 microsecond units. to prevent the buffer from getting too much data (which increases latency and risks overflow) the radios send information on how full the buffer is to the connected device. The APM code adapts its telemetry rates by small amounts to keep the amount of buffered data reasonable. during the initial search for another radio, and any time the link is lost, the radios go into a mode where they move the receiving frequency very slowly but move the transmit frequency at the normal rate. This allows the two radios to find each other for initial clock sync. How long this takes depends on the number of channels, the air data rate and the packet loss rate. where frequency_deviation is in kHz and the air_data_rate is in kilo bits per second.